From ground to dock and back again – Adjustable loading and unloading at any height! The NOVA Dock Lift is the most versatile way to serve the most varied fleet. By keeping the loads level, loading and unloading is safer and easier than ramps and steep inclines, and utilizing almost 5′ of travel height, NOVA Dock Lifts can service almost any vehicle or trailer you back up to them. When the loading area just doesn’t lend itself to a dockleveler or Edge-of-Dock, take advantage of a NOVA Dock Lift. 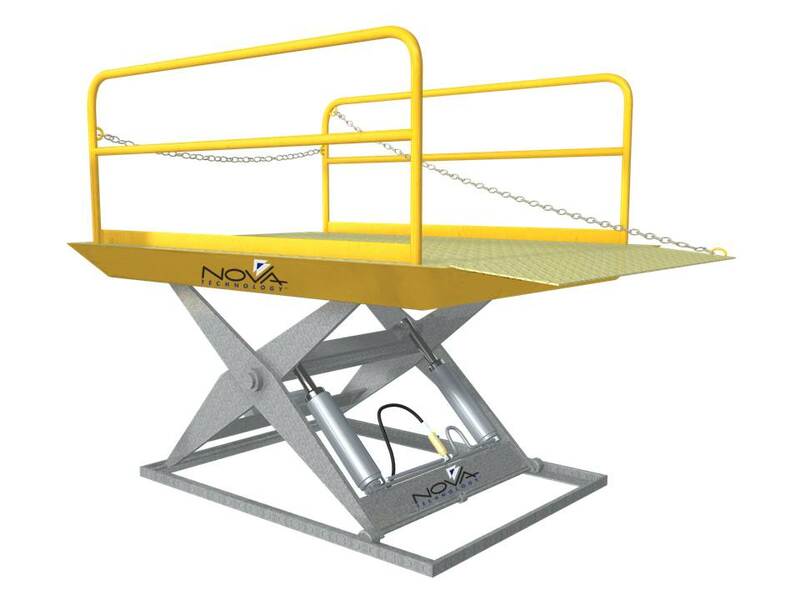 Safer than ramps and inclines, faster than manual loading or unloading, and less expensive than a recessed truck well, the NOVA Dock Lift can be a smarter way to go. NOVA Dock Lifts are manufactured to withstand all types of weather. Constructed with structurally reinforced heavy-duty steel platforms that minimize deflection, and their wide stance and rugged base construction to create one of the most ridged and stable dock lifts in the industry. Both the NOVA NDL6x8 and NDL6x9, 5,000 lb. and 6,000 lb. capacity units come standard with a galvanized base and legs for added protection even in the harshest environments.